Top shelf Want a top shelf luxury experience give this place has it all. Facilities, location, cleanliness all top of class. A place you would definitely come back to. 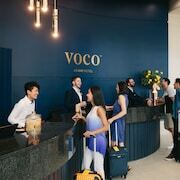 Great hotel close to Jupiters Casino, beach, shops Great hotel close to beach, across the road from Jupiters casino, and pacific fair shopping centre is around the corner. The hotel amenities are great. 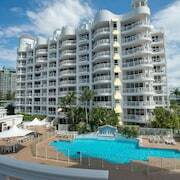 Great location - beautiful pools, spa and sauna Neat, tidy and comfortable unit. A short walk to beach, restaurants and shops. The tram was close by with Pacific Fair as the next stop. 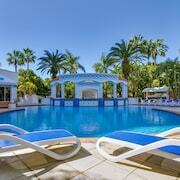 The pool area was lovely, with a great spa and sauna. Do you want to be within walking distance of one of the city’s most prominent landmarks? How would you like to wake up in the morning with a view of it outside your room window? This is so easy to accomplish, it’s almost ridiculous. 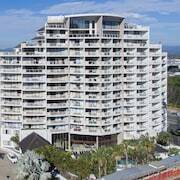 Just book a stay at one of the many discount hotels near The Star Gold Coast and you’ll be able to throw a googly to it. A few days ago, the famous sites down the street only existed in brochures. But now, you can begin the morning by mapping out your day from your balcony. See that place off in the distance? 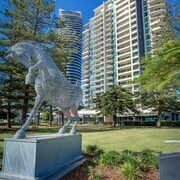 That’s where you want to be, so flag down one of the taxis, snag one of the buses or just hoof it from accommodation close to The Star Gold Coast. You can also check with the hotel concierge about any tour packages available, just be sure to have your camera ready because a new holiday album could be in the making. Don’t just look for some rum-dum joint to crash in during your holiday—and yes, camping is out of the question. 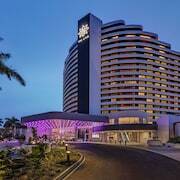 Use lastminute.com.au to find the best deals on The Star Gold Coast hotels to keep your budget intact, even if you’re booking at, yes, the very last minute! Spend the money you save on extra adventures outside the city limits!